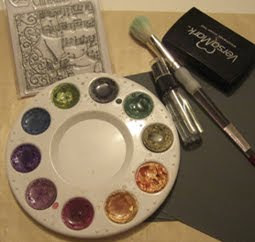 All of these items can be bought at http://www.imaginationcrafts.co.uk/ if you can't find these items or have any problems call 01935 813664, we will happily help you. 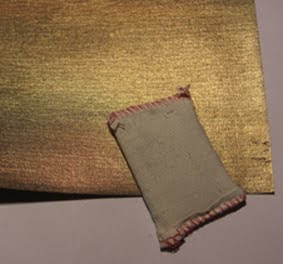 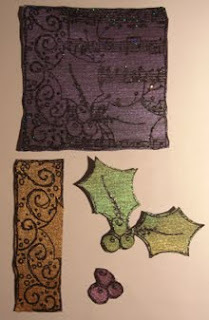 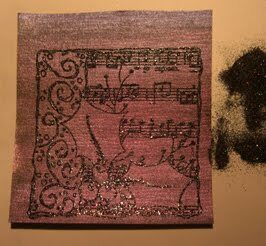 Add Approx 1 teaspoon of assorted glitter to 70grms roughly 1/2 a small pot of Fine detail Black embossing powder. 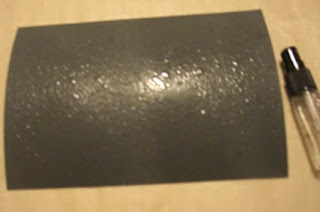 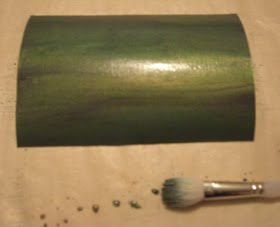 Now spritz the card stock with the water and spread over the card stock. 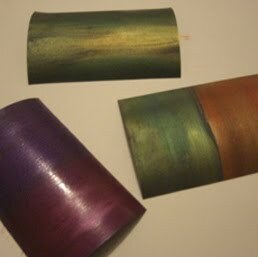 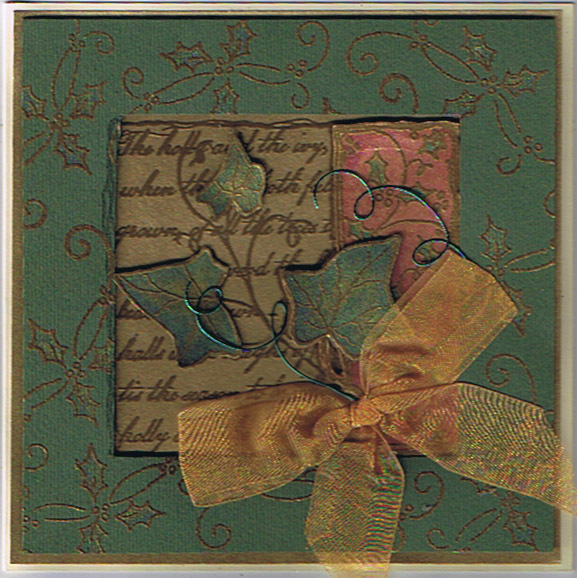 Before you Start embossing, rub the anti-static bag all over the dry coloured card stock and remember to do this EVERY time before embossing. Place you stamp on the rock-a-block, inkup with Versamark and stamp onto the pre-coloured card stock. 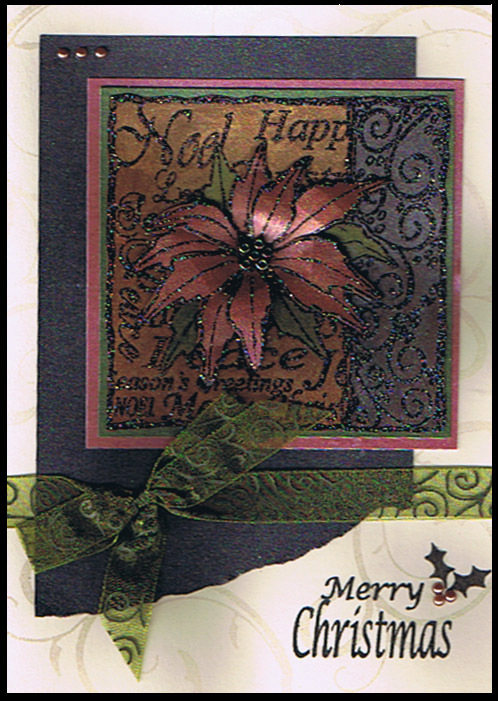 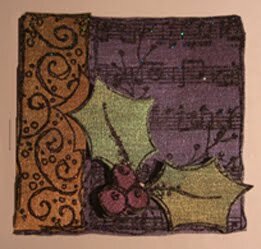 Sprinkle the embossing powder over image tap off excess, and heat emboss. this was then mounted onto gold ,then black card stock the next layer was the green gold layer the top right hand corner and bottom left corners were embossed with the sparkle embossing powder and the stamp from the set .this was mounted onto black card stock and then onto the cream card. 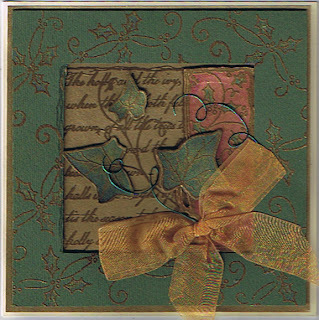 Add the ribbon befor attaching layers to the card. 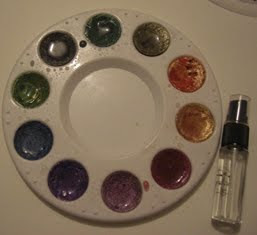 For a touch of gloss add Magi glaze to the berries once dry this adds a glossy shine to them. 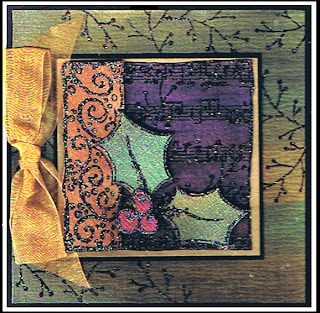 This card was embossed with the sparkly Embossing Powder, then coloured with a water brush directly from the pallet. Watch out soon for the next Technique...I will do my best to get another technique to you next week.